After months of rumors swirling about, today Canon finally launched its new flagship DSLR: the Canon EOS 1D X. This new camera will replace not just the EOS 1Ds but also all EOS 1D current models… and will bring the APS-H sensor size to an end. This new high-end camera is based on an 18MPix CMOS full-frame sensor and can reach a shooting speed of 14 fps (12 fps with auto-focus). It also features a high-precision AF system with 61 points, and 41 high-sensitivity cross-type sensors to ensure a very fast and precise auto-focus. Its 100–51,200 ISO and dual DIGIC 5 processors should ensure a low level of noise. The 1DX can even push its sensor to 204,800 ISO, the highest ISO on the market. (It will be interesting to see how good the pictures are at that ISO.) In term of metering, the 100,000-pixel RGB AE associated with the dedicated DIGIC 4 processor should help you under most lighting conditions. The 1,040k-dot 3.2-inch LCD screen is announced as “superbly durable” and will give you a good idea of your picture results while shooting. And when shooting indoors, the 1GB ethernet connection will enable you to stream and check your photos directly on your PC or Mac. The 1Dx also offers advanced video capabilities with full HD (1080p) and a wide range of controls such as exposure, frame rates, audio, and compression. 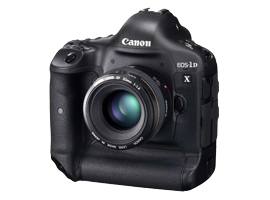 The Canon EOS 1D X will be available in March 2012 for the price of $6,800. Canon’s new professional digital SLR – the EOS-1D X – is a sports photographer’s dream. It shoots a dizzying 12 pictures per second, features a 61-point autofocus system, and pushes the upper limits of light sensitivity with a marketed ISO range of 100 to 51,200 (we’ll be sure to test the camera’s ISO for accuracy). Its industrious design and weight of 1.34 kg make it a tank. So does its asking price of about $6,800 (US). Much of this extra cost is being attributed to the EOS-1D X’s added brain power, which includes not one, but three processors! But is the extra brain function worth the cost? Here’s a look at how the EOS-1D X compares with its predecessor, the EOS-1D Mark IV; its little brother, the EOS 5D Mark III; and its direct rival, the Nikon D4. It helps the EOS-1D X offer a gain in resolution of 2 megapixels, and on a larger surface area. Our tests will most likely confirm that the EOS-1D X will have better low-light sensitivity than the EOS-1D Mark IV. The APS-H sensor –found in a number of DSLR cameras – often gives a “crop factor” to images, meaning the sensor minimizes the field of view. By eliminating this sensor, Canon consumers shooting with wide-angle lenses will get images truer to what they see in the viewfinder. While advantageous, it carries problems for some photojournalists (sports and action photographers in particular) who view the APS-H as a natural 1.3x lens extender — for example, a Canon EF 300mm f/2.8 L IS USM was the equivalent of a 400mm lens (well, 390mm, to be exact). The Canon EOS-1D X brings a number of improvements to the already high performing EOS-1D Mark IV. It debuts a new autofocus system that includes 61 auto-focus points (vs. 45 for the 1D Mark IV). The camera relies on three processors, including two DIGIC 5+ processors, which Canon advertises as being 17 times faster than the EOS-1D Mark IV’s DIGIC 4 processor. There is, however, one change that is really going to negatively affect photojournalists and full-time photographers: the battery life of Canon EOS-1D X’s is sharply reduced compared to the EOS-1D Mark IV’s, which itself was already quite modest for a pro SLR (1500 shots). With only 1120 images per charge, the Canon EOS-1D X’s new battery seems to fizzle at keeping up with the high-energy needs of the dual DIGIC 5+ processors, in addition to all the various automatic features and motors. The price of professional cameras continues to increase – the EOS-1D X is no exception. Canon’s newest iteration will set you back $6,800 (US), nearly $1,800 more than the EOS-1D Mark IV. Bye-bye to Nikon’s lag-behind video mode: today, the Nikon D4 is on par with the Canon EOS-1D X and goes so far as to propose a few additional refinements, starting with the ability to export the video stream via HDMI 4:2:2 output. Both the Nikon and Canon cameras have an ethernet port and compatibility with a new WiFi transmitter that makes it possible to connect with a smartphone or tablet internet browser. Such connectors are a real asset for those looking for quicker integration with their workflow, such as those adopted by cable news agencies. The two cameras have honed their automation with 51-point autofocus for the Nikon D4 and 61-point autofocus for the Canon EOS-1D X, both coupled with scene recognition sensors that weigh in around 100,000 points. The Canon has the advantage of a far greater number of cross-type collimators — 41 vs. 15 for the Nikon. Both cameras have made progress in terms of burst shooting speed. The Canon retains superiority, however: in normal mode (that is, with autofocus tracking and exposure metering on), the EOS-1D X attains 12 fps versus 10 fps for the Nikon D4. With automatic features disengaged, the Canon achieves a record 14 fps versus 12 fps for the Nikon. Both cameras have seen their autonomy reduced compared to their respective predecessors because of new regulations governing Japanese electronics. But as for the battery optimization game, Nikon has limited the damage with an announced autonomy of 2600 photos per full charge, whereas the Canon promises only 1120 photos for a fully-charge EOS-1D X. That’s not much. The Nikon D4 is very similar to the Canon EOS-1D X — more than Canon and Nikon professional SLRs have ever been before. The retail price of the Canon EOS-1D X, however, is 500 euros higher than that of the Nikon D4. We’ve already said that the EOS 5D Mark III can be considered a baby-EOS-1D X, because it utilizes some of the same up-to-date technologies, such as 61-point autofocus and measuring exposure via a 100,000-pixel, 63-zone iCFL color sensor. But a baby-EOS-1D X is not an EOS-1D X: the EOS 5D Mark III’s autofocus, so close to that of its big brother, is not as fast (a double Digic 5+ processor for the former versus a single DIGIC 5+ processor makes a big difference), nor does it couple color measurement to exposure, as does the EOS-1D X’s. Although the EOS 5D Mark III has nothing to be ashamed of in terms of its burst shooting rate (6i/s) when compared to its predecessor or to the Nikon D800, the EOS 1-D X still claims the lead with burst shooting at 12 i/s (and even 14 i/s without exposure meter or autofocus, mirror raised). And while the sensor definition is fairly close for the two cameras (i.e., 18 and 22 megapixels, respectively), one can quite naturally assume that the EOS-1D X’s sensor has the upper hand. Short of surprising test results, the EOS-1D X will most likely further cement its position as an excellent camera for reportage, for field work, and for quality photos in low light. Finally, the finish, the tropicalization, and the overall robustness of the EOS 1-D X are still a notch above those of the EOS 5D Mark III, despite the progress Canon has made with its third generation of 5D cameras. More professional, the EOS-1D X retains certain exclusive features in the Canon reflex line that allow it to insert itself better into one’s workflow — for example, its RJ45 ethernet port. Still, the EOS 5D Mark III has quite a few things in its favor, including portability and discretion (when in silent mode), its greater affordability, and a headphone jack for video mode — an important refinement, especially if shooting video is a priority for your work.